Audi India is the largest luxury car maker at the moment, as it became the first automaker to cross the 10,000 units mark in this range of manufacturers. While competition is introducing higher-end cars, Audi becomes the first automaker to introduce a compact sedan for our market. The Ingolstadt-based carmaker invited us to Udaipur to drive the new compact sedan. Now, Mercedes-Benz too is introducing the CLA-Class, which will be competing with the A3, however at the moment only the AMG spec car will be made available and the conventional variants will come next year. Hence, the A3 is the only car in this segment. We share our first-hand impressions of this new compact sedan. The A3 follows the new design language of the Audis. The string of LEDs have now been replaced by a smooth LED fluid that we have seen on the A4, A6 and the RS 5. The LED has been become thinner and there is a variant with only halogen lamps and no LEDs. There are two types of front grille, different for variants and fog lamps aren’t available on all the variants. The silhouette is very much like an Audi, it has a sloping roof-like to add that more sporty look. The wing mirrors resemble the TT— a shift from the conventional mirror styling. There is an option of panoramic roof too. The rear design is an evolution of the current Audi design, with a new cluster for the LED tail lamps. The integral spoiler and a similar Audi-styled rear bumper are visible on the A3. The design is compact and well proportioned. It carries a hint of the A6 design in it. The outside styling of the A3 isn’t very different from the conventional Audi styling, however the instrument panel has been redesigned. It boasts a brand new key design to begin with, and a majority of the elements have been changed on the inside, except for the four-spoke steering wheel. There is a new instrument cluster, which is less clattered and simpler to look at. The twin dials even house temperature and the fuel gauges. There are these new circular air-con vents that diffuse and concentrate the air at one point. There is a simple adjustment on them. Then there is also the new MMI system, with touch pad on the knob and redesigned air-conditioning controls that are a lot simpler to operate despite being dual zone. The controls on the steering wheel control everything except skipping through tracks. There is also a screen that rises and sets back into theslot neatly on push of a button. One very important aspect for us Indians is the space. The front row seats are large and comfortable with loads of head room and leg room for front row passengers with good back support and could be better side support. In the second row the knee room is tight for tall people, and the thigh support is just fine. The boot is surprisingly large than what it looks from the outside. Audi A3 comes with two engine options, first being the 2.0-litre diesel and second 1.8-litre turbo petrol. The 2.0-litre churns out 143bhp of power and 320Nm of peak torque. Diesel will be the big seller and this engine will be mated to a six-speed S-Tronic dual clutch transmission. The power produced by this engine is just fine and the torque curve is almost flat, which means better retractability from the engine. It pulls even at low rpms without any kind of struggle and it has a strong mid-range. This is the same Q3 S engine with an automatic box. The shifts are smooth and there is a bit of lag in the comfort and the manual mode. The response of the gearshifts and the throttle is augmented in the Sport mode. There are no paddle shifts, but what it gets instead is tip-tronic transmission. We didn’t get our hands on the petrol engine as it wasn’t available for a drive, however we will soon get this variant too in the coming days. This petrol will come mated a seven-speed S-tronic dual clutch box. 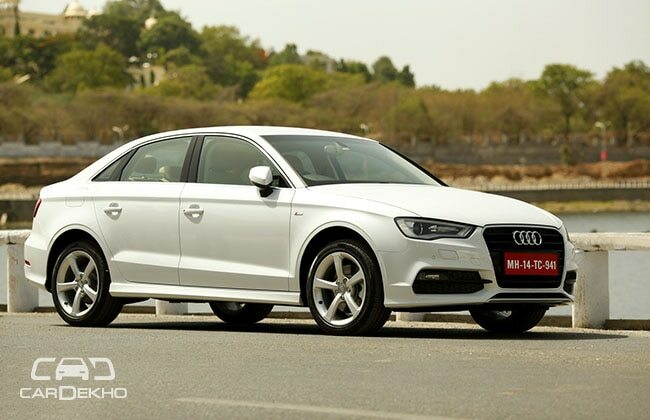 The Audi A3 has been tweaked for Indian road conditions and hence the suspension set-up is a tad softer. The ride is pliant and doesn’t feel unsettled even at high speeds. The ride is supple at low and high speeds and the suspension does a good job to absorb all the bumps and shocks without causing any inconvenience to the occupants. The handling too is good enough, it doesn’t have body roll but what it needs is better side support on the front seats. The steering wheel also weighs up well and this is one aspect that we appreciate the most. The feedback from the steering wheel is good and the movements are responsive too, it doesn’t feel slack at any time. The A3 just won the World Car of the Year 2014 and there is no denying in it being a good product. The space is decent, power is good and features on offer are certainly worth an addition. The question araises now is of the pricing, the ideal one will be between Rs 28-34 lakhs.